Some muscle car fans may have been hoping for the release of the 2020 Mustang Shelby GT500 at this years 2018 Los Angeles auto show, but you’ll have to wait a little bit longer as a now it is due for January’s 2019 Detroit Auto Show instead. Ford have been drip teasing us over the last year or so with a few teasers of the car. 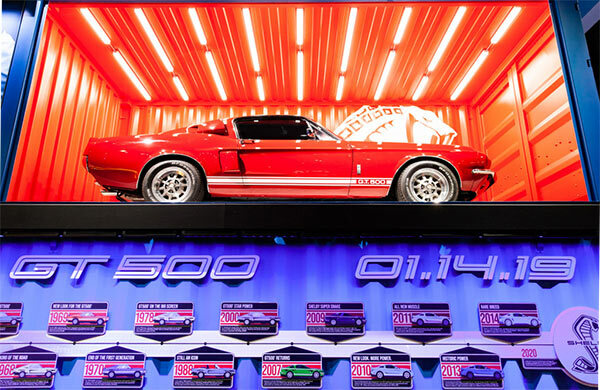 One such example is at Los Angeles show housed in some large blue shipping containers a 1967 Ford Mustang Shelby GT500 with ‘GT500 1.14.19’ on the side, with 13 cards showing the different Shelby Mustangs throughout its history. The 1.14.19 being the date of January’s Detroit show. What we know to now about the upcoming GT500 is a 5.2-liter supercharged V8 with 700 hp plus. The flat-plane crank of the Mustang Shelby GT350 will probably be dropped for an alternative. it’s unclear what type of transmission will be available, but there are possibilities it could be a dual-clutch variety. The GT500 will be compared to the likes of the Dodge Challenger SRT Hellcat Redeye and Chevrolet Camaro ZL1 1LE, the former with 797 hp and the latter with 650hp, but the competition may also taking other brands such as Porsche and Mercedes as the GT500 becomes ever more sports orientated.